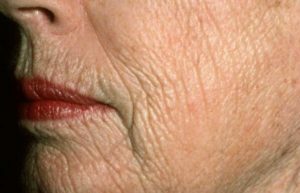 Solar elastosis, or actinic elastosis, is a disorder in which the skin appears yellow and thickened as a result of sun damage. Other tell tale signs include; rough surface, deep creases, fine wrinkles, and plaque-like thickening. There may be color changes characterized by yellowish shadow, irregular pigmentation and telangiectasias. It will present on areas most exposed to the sun such as the face, neck and arms. Solar Elastosis is concerning because it is an indication that the patient has had significant sun during there life. There is an increased concern of skin cancer and regular skin cancer checks are important. In addition to the increased risk of skin cancer many patients are troubled by, and seek treatment to improve, the appearance of their skin. Preventative measures may slow the progression of solar elastosis and decrease the chance of skin cancer. At our Del Mar dermatology practice we treat solar elastosis with a combination of fractional skin resurfacing (Fraxel Laser) and vascular laser (Vbeam Perfecta for redness). Alexandrite lasers are also helpful in reducing irregular pigment. Topical Retinoids and Growth Factors, such as, SkinMedica Retinol Complex 1.0 % applied nightly has shown to improve the appearance of skin texture, color and overall health. TNS Essential Serum, also by SkinMedica, is a top rated growth factor-antioxidant- peptide complex. This has been clinically shown to stimulate collagen, heal and repair, and decrease surface and subclinical sun related changes in the skin. Of course, we also recommend daily SPF of 30 or higher with titanium dioxide or zinc oxide. Your sun protection needs to be reapplied every 2 hours when outside for activities or after swimming. For more information about Solar Elastosis, or to schedule a consultation at our Del Mar, CA office please contact us.